Advertise Online  Corona Extra Subliminal Advertising  New York City History  NJ Bicycle Routes  The William Burroughs Nike commercial  Intellectual Predator  A Place Like This  Beware of yoga? 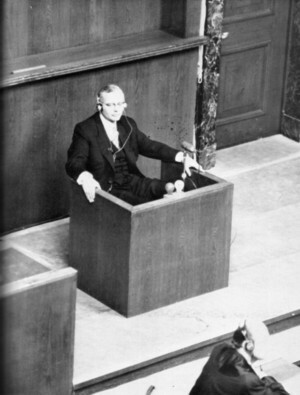 Hans Bernd Gisevius giving testimony at the Nuremberg trials. Gisevius, a leader of the German underground during World War II, was also a double agent for the OSS. He was Allen Dulles's pipeline to Admiral Canaris, chief of the German Foreign Intelligence Service (Abwehr) until 1944 who himself served as a high level British informer during most of the Second World War. From Frank Hague to Robert Janiszewski, in this New Jersey county, political corruption is a tradition. Former NJ Governor Brendan Byrne wants to be buried here so he can stay active in Democratic politics! You'll find lots about Jersey City Mayor Glenn Cunningham and Congressman Robert Menendez, too. Raging Bull Market or Chop-Meat? Let the Advance-Decline Line Help You Decide!